Jon Taylor fires home the winning goal for Posh at Shrewsbury. Photo: Joe Dent/theposh.com. In many ways this was the perfect audition by Peterborough United caretaker-manager Grant McCann. Win? Tick. Exciting, dramatic game? Tick. Field a youngster? Tick. Score plenty of goals? Tick. Play a passing game? Tick. You’re not Graham Westley? Tick. Defend well for 90 minutes? Well, you can’t have everything. Lee Angol celebrates making it 2-0 for Posh at Shrewsbury. Photo: Joe Dent/theposh.com. This was the perfect antidote to the chairman’s stress levels which appeared to reach boiling point this week amid a flurry of accusations, counter-accusations and more mud-flinging than you’d find at an angry farmers’ convention following Westley’s inevitable departure. This is how Darragh MacAnthony likes his football and McCann’s team served it up with a display, that was too frenetic to deserve high praise, but contained enough passion, energy and pace to suggest a full-time appointment for the stand-in wouldn’t go unappreciated by the playing squad. Posh led 3-0 with 20 minutes to go, but surrendered that lead in 16 crazy minutes before substitute Jon Taylor, a former Shrewsbury player, claimed a 94th-minute winner for McCann’s men. It was a fitting climax to a brilliantly thrilling final 30 minutes and it was smiles all round 30 minutes after the final whistle as Doncaster’s incompetence at Crewe led to Shrewsbury’s League One survival becoming guaranteed. McCann’s record as a stop-gap is now two away wins (nine goals scored) and a draw spread over seven months. He made enough changes to his predecessor’s last starting line-up to hint that his own opinion wasn’t always taken on board when a mere assistant. Referee Graham Salisbury sends off Shrewsbury's Ian Black in the match against Posh. Photo: Joe Dent/theposh.com. Whether or not this matters as far as long-term job security is concerned could depend on events in Leeds and elsewhere, but McCann certainly has a gift for generating positive atmospheres and feel-good factors. The players had the shackles of passing, shooting and long-distance running requirements removed and played with far greater freedom and far less tension as a result. It was far from perfect of course and if Taylor hadn’t accepted Marcus Maddison’s sweet pass, driven into the penalty area and fired a low left-foot shot under the body of replacement goalkeeper Mark Halstead - first-choice Jayson Leutwiler pulled a back muscle in the pre-match warm-up - halfway through a lenghty period of added time the mood in and around the camp and the tone of this report would probably have been vastly different. It was a poor first-half ruined as much by a strong wind as players performing poorly. The home side had the elements in their favour and dominated territorially, but poor final balls and weak, wayward finishing stopped them turning possession into goals. Star man Sullay Kaikai missed two presentable opportunities before his wickedly struck 20-yard freekick was well tipped over the bar by 39-year-old goalkeeper Mark Tyler. Gradually Posh did grow into the game, helped by a return to form of classy midfielder Chris Forrester. Forrester shields the back four superbly thanks to an ability to anticipate danger and he controls the tempo of the Posh passing which grew smoother and faster as the match wore on. Post-match, much was made of Adil Nabi’s improvement (strangely after being asked to play in a more natural attacking position) and 17 year-old Leo da Silva’s obvious potential (he looked athletic, sharp and skilled in his match), but if a promotion push is to materialise next season, Forrester must remain fit, appreciated and unsold. Despite occasional moments of quality from Maddison, Nabi and Da Silva Lopes, Posh threatened little until Maddison failed to win a penalty when clearly tripped in the act of shooting and Da Silva Lopes smashed a 25 yard-shot which troubled, but failed to beat Halstead. But two minutes before the break, Nabi’s precise corner was powerfully headed home by centre-back Jack Baldwin. It was the captain’s first goal for Posh in 45 appearances and a first goal anywhere for over three years. There was still time for Tyler to produce a breath-taking save from Andy Mangan and for Mat Sadler to volley over the bar when well-placed, but the expected attacking rush from a home side who were still desperately in need of points at that time didn’t arrive, well not at first, in the second period. Instead Posh scored again within 35 seconds of the re-start as Maddison’s lovely pass freed Shaquile Coulthirst who did well to keep his balance under pressure before setting up Lee Angol for a simple finish. If Coulthirst can find such vision to match his speed and energy levels on a more regular basis, he could yet be an automatic pick in a selection process that can’t help, but become more stable in the future. And Angol emerged from a quiet opening 45 minutes to reveal his strengths. Twenty minutes from time a cute pass from Nabi enabled him to finish expertly to claim goal number 11 of a promising first season at this level - he also scored twice in McCann’s debut match in charge at Oldham last September so a change in boss might just be what he needed. That should have been that, but within seconds of Taylor arriving from the substitutes’ bench to generous applause from the home crowd, Jean Akpo-Akpro’s ambitious shot at goal veered into the net off Michael Smith’s boot and two poorly-defended crosses led to headed goals from Mangan and Jack Grimmar, which was a major surprise as Baldwin and central defensive partner Gaby Zakuani had made so many headed clearances they might well have finished the game requiring generous doses of Paracetemol. Stopping crosses at source has been a major problem for Posh, but they employ their full-backs so high up the pitch they remain vulnerable to counter-attacks and good wingers if possession is lost. Even during Shrewsbury’s comeback spell, Posh often created mayhem on the break with Maddison twice testing Halstead before an audacious chip from the same player drifted the wrong side of the post. After the winning goal home midfielder Ian Black picked up a second yellow card for hacking Maddison down. In the end Taylor ensured victory. He didn’t celebrate his goal out of respect for former employees, but the rest of the squad enjoyed their victory in a more traditional way. Posh: Mark Tyler, Michael Smith, Harry Toffolo, Jack Baldwin, Gaby Zakuani, Chris Forrester (sub Callum Chettle, 80 mins), Leo Da Silva, Adil Nabi (sub Jon Taylor, 73 mins), Marcus Maddison, Lee Angol, Shaquile Coulthirst (sub Aaron Williams, 87 mins). Unused substitutes: Dion-Curtis Henry, Ricardo Santos, Harry Beautyman, Erhun Oztumer. Shrewsbury: Mark Halstead, Mat Sadler, Zak Whitbread, Nat Knight-Percival, Abu Ogogo (sub Akpa Akpro, 53 mins), Sulley Kaikai, Jack Grimmer, Larnell Cole (sub James Wallace, 53 mins), Ian Black, Andy Mangan, Shaun Whalley. Unused substitutes: Dominic Smith,Richie Wellens, James Wesolowski. Goals: Posh - Baldwin (43 mins), Angol (46 mins & 69 mins), Taylor (90 + 4 mins). Shrewsbury - Akpa Akpro (74 mins), Mangan (85 mins), Grimmer (90 mins). Sending-off: Shrewsbury - Black (second caution, foul). Cautions: Posh - Baldwin (foul), Da Silva (foul), Coulthirst (unsportsmanlike conduct). Shrewsbury - Whalley (foul), Black (foul), Mangan (unsportsmanlike conduct). 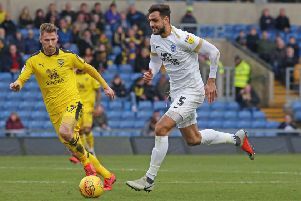 Alan Swann was at the New Meadow for the Peterborough Telegraph so follow all the team news, LIVE commentary, match report and match reaction here click here.